For the past 10 years Wiradjuri Traditional Owners and their supporters have kept their feet rooted firmly in the ground against the worlds largest gold mining company Barrick Gold. With their wads of cash and giant machinery Barrick Gold continues to desecrate Lake Cowal with a proposal to expand into the lake bed, doubling the size of the mine and extracting a further 53 million tonnes of ore from the open cut pit. This will add another 11 years to the life of the mine (until 2024). Barrick's water usage would increase to over 5GL per year. 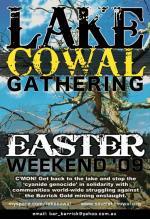 The SaveLakeCowal campaign needs your support in 2009! Uncle Chappy won an injunction injunction restraining the NSW Minister of Planning from determining the E42 Modification Request for the proposed expansion of Barrick Gold's mine in Lake Cowal. One of the largest global pension funds withdrew its 200 million shares because of the environmental concerns and impacts on the local Indigenous Ipili community at Barrick's Porgera mine in Papua New Guinea.